Wanna Sip? 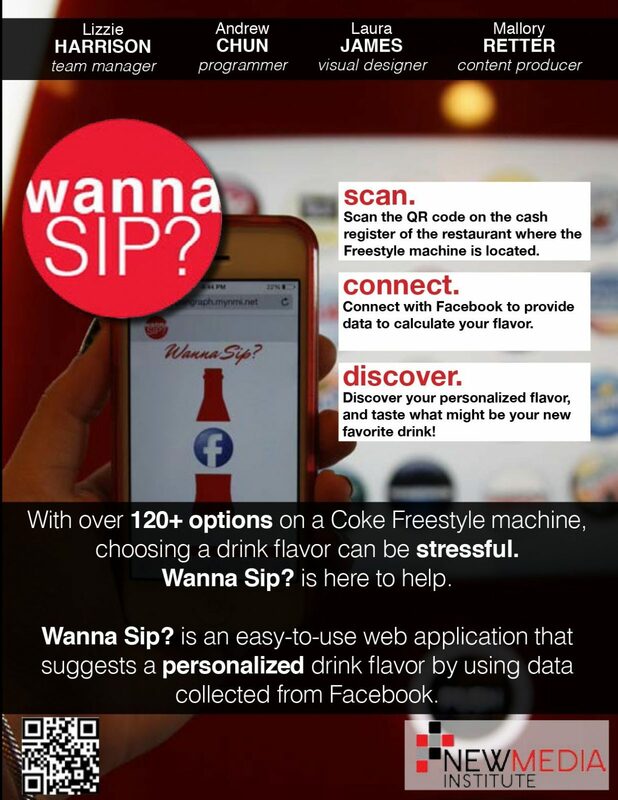 is a web application that will take you through a fun, entertaining, and interactive experience in finding a special drink catered just for you from the Coke Freestyle machine. The easy and cool part about our application is that you will be able to scan a QR code found on the Coke Freestyle machine in any of the restaurants the machine is found in, and the code will take you right to the application. Then, you will get to see the likes being pulled in directly from your already logged in Facebook account, being processed, and then out popping your customized flavor! It takes away the stress of not being able to choose from over 120 options on the machine! So easy! Wanna Sip? will be focusing on the paradox of choices. This paradox comes from the overabundance of options consumers have in the marketplace. These choices have been linked to depression, anxiety, and unsatisfied customers due to the “what if” factor of so many choices. Wanna Sip? will address this by narrowing in on a soft drink that is specific to the persons likes and wants and will lead to happier choices and less anxiety at Freestyle machines and store purchase of Coke products.